LondonScape began as an idea for the ArtAngel/Evening Standard Ideas for London competition. The original concept was inspired by the Tree Of Souls from the film Avatar. Its roots connect all living beings, and the planet itself. The idea is to use digital technology, data science and creativity to show our shared humanity and the idea of a connected universe. It has been 10 months since the team won the competition and had dinner on the boat above the Thames, to think about how they could make the idea a reality. Since then, the team has had over 100 meetings (see PDF) with experts in data science, data visualisation, engineering, open data, design, policy,architecture etc. We have also secured a site with Westminster Council to use as a test bed for exploring questions that need answers before the larger structure is built. 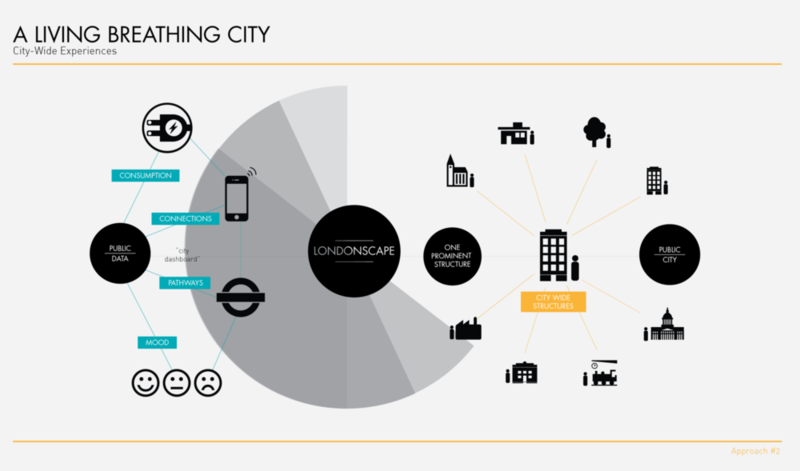 Whilst the prototyping gets underway in this pilot area, we also retain the bigger vision: at a time when awareness of our interconnected humanity is more important than ever, producing LondonScape at the originally envisioned scale is still the ambition. • It needs to be visible and prominent so that it is in people’s consciousness and in people’s peripheral vision. • It needs to be there for the long-term and although there may be other aspects of it that exist around the city, its core will be a structure that has been designed to last many years. • It will involve multiple visualisations that are interchangeable and integrated. • It needs to be as much about facilitating interaction as conveying information and it must always come back to the collective state. • The data sets that are used will be dynamic and people will generate data for it as much as we will use data sets from business/institutions etc. • It will be created using open API’s so that the system and design can be transferred to other cities. Eventually it will be a way for different cities to talk to one another. • As it grows to have other touch points around the city it will link with wearable technologies and other internet of things hardware. • It needs to address our twin attention spans – the short-term desire for information and stimulation and our growing longer-term consciousness about our impact on the future and our productive role within a larger ecology. These are the images we created for the original idea and which still represent some of our vision for how the structure might interact with the city. RT @CassieRobinson: Great talks at @Urbanista_org this eve. Love @daisyfroud reminding us about the role of institutions in change.